Lincoln Burrows is currently on death row and scheduled to die in a few months for an assassination his younger brother Michael is convinced he did not commit. 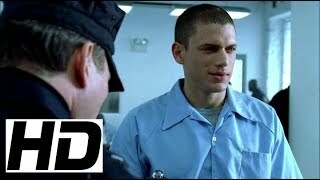 With no other options and time winding down, Michael takes drastic measures to get himself incarcerated alongside his brother in Fox River State Penitentiary. Once he's inside, Michael, a structural engineer with the blueprints for the prison, begins to execute an elaborate plan to break Lincoln out and prove him innocent. When Michael arrives at the jail, he meets the prison denizens who will, unknowingly, help in his escape plans. Meanwhile, outside the prison walls, the brothers' childhood friend and Lincoln's lost love, attorney Veronica Donovan, works within the law to free them; Lincoln's teenage son LJ may be going down a path similar to his convicted father's; and Secret Service Agent Paul Kellerman's investigation into Lincoln's case proves that there may be a national conspiracy at work.